I have been writing a post in my head about Latin men and the surprising way the ones I am currently working with in the Mexican restaurant sometimes act, but then yesterday I spent the day working with a couple American men at the steakhouse and I realized men in general are a mystery, not just los Mexicanos and Guatamalens. I need to rethink some of what I was going to say, but in the meantime I would like to sing praises for the Michilada. Saturday night around closing time one of the waiters brought the head cook a pitcher of red stuff. I must admit that at first I thought it might be some sort of chemical concoction to use for cleaning, but then he asked me if I liked Michiladas. I hadn’t even thought about one in years but I had been hoping someone there would offer me a drink so I said I did. And boy do I like it. I enjoyed it so much that when I left work I went straight to the grocery store to buy the ingredients to make more. I drank one yesterday and two today. I hope to have another tomorrow. A Michilada is like a Bloody Mary only with beer instead of vodka. 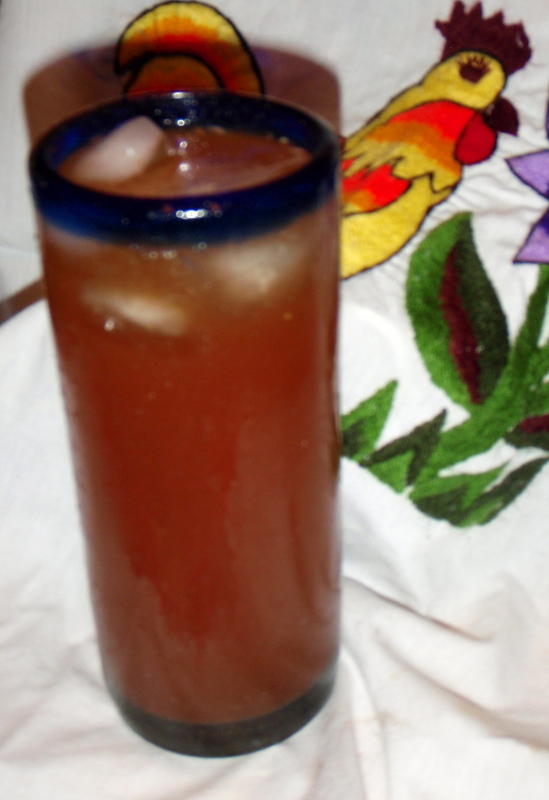 Start with about a fourth of a glass of Clamato, add a few drops of worchestcher sauce, some hot sauce (to taste), squeeze in half a lime, sprinkle a bit of salt (or salt the rim first) and then fill the rest of the glass with a light Mexican beer, I used Modelo Especial. So refreshing and satisfying, I would go make myself another right now if there was more beer in the house.